RYA Certificates of Competence are some of the most useful and credible of all professional yachting qualifications. They thoroughly test the skipper’s ability, and can therefore appear daunting to potential candidates. We therefore highly recommend taking a preparation course prior to attempting the exam. The Yachtmaster practical exam involves living aboard and skippering a cruising yacht which will undertake a number of exercises dictated by an Independent RYA/MCA Examiner. our RYA examiner will meet you onboard and talk you through the plan for the day. They understand that you could be nervous and will do their best to allay your fears and make sure you are clear about what they want you to do. They are there to find out what you can do, rather than pick holes. 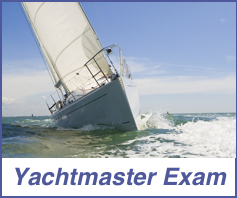 You will be assessed on every aspect of the Yachtmaster syllabus. The Examiner will spend a minimum of 12 hours (8 for Coastal) with each candidate. If successful, your Yachtmaster Certificate of Competence will be issued by the RYA (not the school) and sent to you in the post. Price includes exam fees, use of a school yacht, and Greek VAT at the appropriate rate. You will also be required to pay a contribution to the Examiner's travel expenses.